Underfloor heating is much more affordable than many people think and is no longer just a luxury option for the super-rich. In fact, installing underfloor heating can actually save you money by helping to reduce your energy bills as well as having the potential to increase the value of your property. The different types of systems available means underfloor heating can easily be fitted to both new and existing homes, meaning everyone can have the benefits of heat under their feet. In spite of their popularity, radiators are actually a relatively inefficient way to heat a room. They only directly heat the space immediately around them meaning you must have your system set relatively high in order to successful heat an entire room. This wastes energy and can also leave you with significant differences in temperature across a room. Because heat rises a large percentage of the warmth generated by a radiator can also disappear through your ceiling rather than going where you want it. By comparison, an underfloor heating system provides even heat across a room, with the warmth it produces rising uniformly to give a constant temperature throughout the space with no cold spots. Because these systems provide direct heat over wider area, you can keep your heating at a lower setting while still achieving a comfortable temperature. This means you use less energy and so can potentially save money and reduce your carbon footprint. • Underfloor heating can be used under stone, tiles, wood and even carpet. • Systems can easily be fitted in both new builds and existing homes. • Doing away with radiators frees up wall space allowing you to use your rooms more flexibly. • The joy of feeling a warm floor under your feet on a cold day really can’t be overstated! 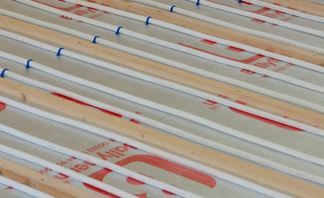 Where can underfloor heating be used? Underfloor heating can be fitted throughout your home, but is especially popular in kitchens and bathrooms. Kitchens can benefit enormously from the extra wall space which can then be used for cabinets and white goods, while the luxurious feeling of stepping out of the shower or bath onto a heated floor is unbeatable. There are two main types of system, electric and water-based, both of which have their own advantages. Known as a ‘dry system’, electric underfloor heating relies on a series of heating wires beneath your flooring. These are laid on top of insulation which prevents the heat given off from disappearing into the ground. Electric systems are usually cheaper and easier to install than water-based systems, but tend to cost more to run in the long term. They are ideal for fitting into existing buildings as they take up relatively little space under the floor and can usually be laid very quickly causing minimal disruption. Sometimes referred to as a ‘wet system’, water-based underfloor heating uses pipes connected to your boiler to spread warm water around your home for heating. This is a highly efficient way of delivering heat, allowing you to run your boiler at a lower temperature than with traditional radiators. Wet systems usually cost more to install the dry systems, but tend to have lower running costs over their lifetime so should end up saving you money. The pipes used for this type of system do take up more space than the electric variety, so this has to be taken into account in your building design and can make retrofitting to an existing home harder. Wet systems are most commonly used in new builds where the extra space needed can easily be planned into the construction. One big advantage of wet systems is that they are ideal for connecting to solar water heating systems. This makes them the perfect choice for eco-conscious home owners as well as those wanting to save even more money. If you are interested in having underfloor heating installed in your home, please get in touch with DHS today and we will be happy to advise you or provide a free, no obligation quote. A Bristol-based company who have been operating in the local area for over 40 years, DHS are one of the largest central heating installation firms operating in the South West.